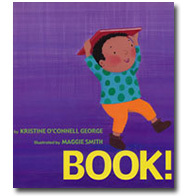 BOOK!—a celebration of books—the perfect book for babies and toddlers with simple, easy-to-read text by an award-winning poet, and bright, contemporary illustrations by a well-known artist. Invite older students to create a skit or choral reading of Book! to share with preschoolers or Kindergartners. 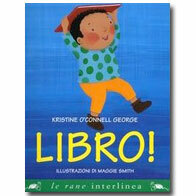 Learn more about Maggie Smith, the illustrator for both BOOK! and ONE MITTEN. Book! was inspired by the grin on a little girl's face when she was handed a new book. Ten-month old Sarah was probably the youngest attendee at the Northern California Booksellers Convention - so young, she was having trouble turning the pages of her new book. So, I sat down on the floor of the convention center and we read her new book together. Again and again. If you've ever been to a booksellers' convention you know how hectic it can be: noisy crowds and what seems like endless acres of books. Sarah didn't notice the chaos - she just grinned and kicked her feet as we read her book. Sitting there, I thought: This is how a lifelong love affair with books begins. One small girl with a gift of one small book. Perhaps it's that simple. The poem that became Book! begins: "My gift is flat and square..." My nieces and nephews will smile knowingly at this line because Aunt Kris' gifts are almost always flat and square. I know they'll outgrow clothes; toys get broken. However, books endure and it's my secret wish that perhaps one of the books I've chosen will be cherished and someday passed down to their children. Tucked beneath the one-hundred and nine words in Book! are a lifetime of memories and associations with books. I still have my battered copy of Horton Hears a Who; I still remember the first book I read by myself - a magnificent story about a yellow duck. Writing Book! also brought back memories of my daughter as a toddler: Spoon-feeding a picture of Mary's little lamb in one of her books. Carrying on passionate conversations with book characters. Or, sound asleep in a pile of books. Maggie Smith's illustrations for Book! are elegantly simple, bright, colorful, and full of delicious humor. I love the cat's antics, the subtle expressions on the elephant's face, and the way Maggie captured a preschooler's joyous encounter with his new book. I'm delighted that Clarion Books, published Book! in both English as well as an English/Spanish bilingual version. 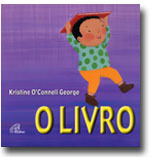 Not to mention that it's also available in Italian, Japanese, and Portuguese! Maggie Smith and I hope you and our young readers will enjoy Book! I celebrated the publication of Book! by donating copies to local literacy organizations as well as donating proceeds from book sales on this site to First Book and Reading is Fundamental and I continue to do so. In these small ways, I hope to honor the work that is being done to foster a love of reading and to bring books into the lives of children across the country. Last year, during a school visit, I met a child during a school visit who doesn't own a single book. Her family owns a television and a few videos, but no books. Sarah, the toddler who inspired Book!, is lucky. She has parents who will read to her and enrich her life with books. I'm certain the little book that enchanted her that afternoon will be just one of many books Sarah will own and love. Other children are not as fortunate. I've been reading about literacy in this country and the statistics are certainly discouraging. Yet, the good news is that there are organizations and individuals who are tackling this issue in innovative ways. The Barbara Bush Foundation for Family Literacy seeks to establish literacy as a value in every family in America. Beginning with Books supports over 200 organizations in literacy efforts. The Center for the Book in the Library of Congress was established to stimulate public interest in books, reading, and libraries. First Book is a national nonprofit organization with a single mission: to give children from low-income families the opportunity to read and own their first new books. The National Center for Family Literacy is a nonprofit organization supporting family literacy projects across the United States. Reading is Fundamental is a national nonprofit organization that develops and delivers children's and family literacy programs that help prepare young children for reading. Learn about their programs and make a donation online. Reading Checkup Guide by the American Academy of Pediatrics has a "reading checkup" for parents and caregivers addressing the different developmental stages of children. Guys Read was masterminded by author Jon Scieszka, the creator of The Stinky Cheese Man and The True Story of the 3 Little Pigs. Jon is rolling up his sleeves to encourage boys to read and he's making reading cool. New York Public Library "100 Titles for Reading and Sharing"